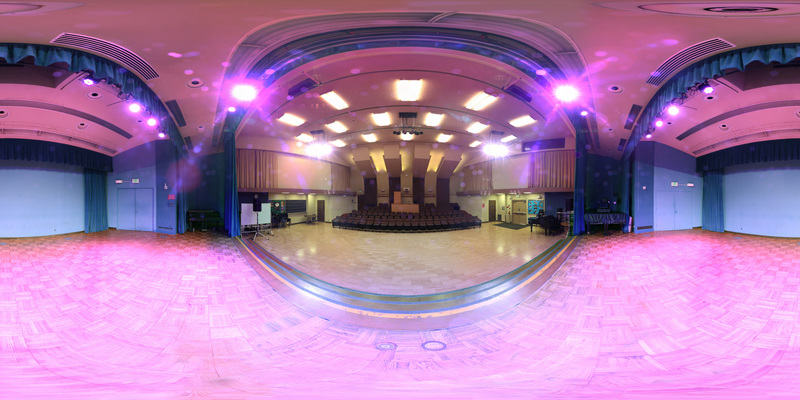 The hall is located on the ground floor of the Music Building on the corner of Chapman and Lemon. It has 75 fixed seats with the capacity for an additional 75. 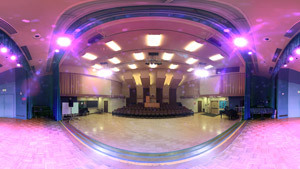 The Recital Hall is equipped with a complete audio system, along with small dimming and video projection systems. 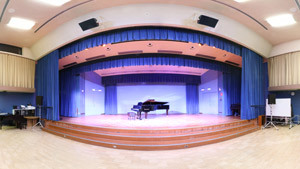 The Recital Hall is perfect for small instrumental and vocal performance as well as corporate meetings. There are two grand pianos onstage making it ideal for piano recitals. It is priced at our lowest rate, allowing even the smallest of studio's a professional environment for students to perform. 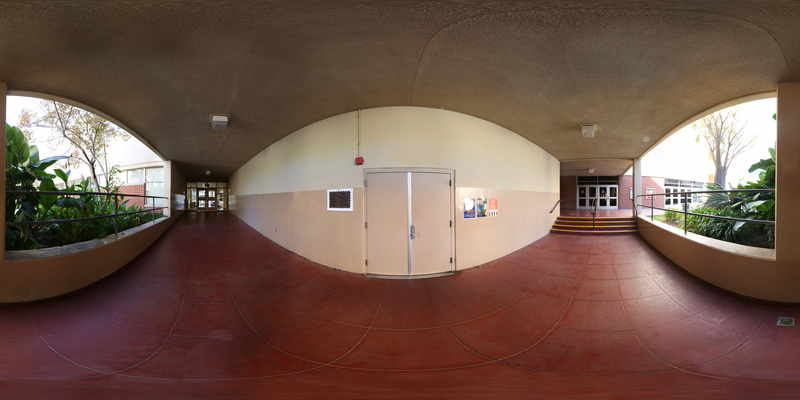 Courtyard, shared with Campus Theatre: 4,000 sq. ft. 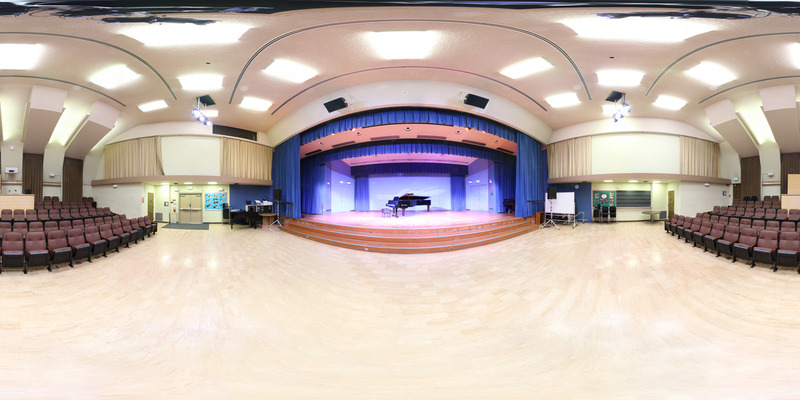 These additional areas around the Recital Hall may help round out the needs of your performers and audience. Each are subject to availability and/or additional charges. 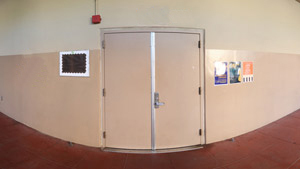 Nearby Classrooms: On average 1,000 sq ft. Good for performers in waiting or additional dressing spaces. The following items included in the "Standard Equipment Package" of $125 per day. Midas Venice 32 Channel Mixing Console with 16 Stage Mic Lines. ETC Smartfade with 24 dimmer channels. The following items are available at an additional cost. See terms & rate schedule for more information. The following are the minimum staff needed to support an event in this facility. Labor rates vary per hour. See terms & rate schedule for more information. These tours offer a 360 degree panoramic view of several key areas associated with the facility. Click on an image below and a popup will open, then grab and drag the image to view the area in all directions. Over 4,000 sq. ft. provides an excellent area for an audience to wait. Tables can be easily added to serve food and beverages. Shared with Campus Theatre, availability may be restricted. Can easily accommodate up to two folding tables for checking-in or ticket sales. A total capacity of 150 seats and the furthest row only 25 feet from the stage. Upstage of the main curtain provides a performance area 36 feet wide by 26 feet deep. We’ve created an extensive list of frequently asked questions. Please review the information before contacting us. Visit the terms & rates schedule page to learn about rates of staffing, equipment and facility charges. Questions or are you Ready to Rent? Contact us today and one of our Event Specialists will return your inquiry shortly. Our usage guide helps new and returning groups gain a better understanding of the rental process. We require both a “certificate of insurance” and an “additional insured endorsement”. Visit the insurance page for more information. Looking for a large-sized facility? 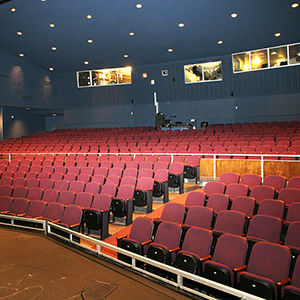 The Campus Theatre offers seating up to 530 and our largest sized stage. To receive a tour of our facilities, reserve a time and date for an event, or to discuss your event needs with one of our knowledgeable Special Events Services staff, please contact us, we'll get back to you shortly!